Multifunctional and effortlessly stylish the Blomus ARA Tray or Soap Dish is part of the much larger ARA bathroom collection. Simply designed with a neutral and attractive appearance, the shallow tray can be used for a range of purposes, from displaying and storing soap to storing jewellery whilst you’re bathing or showering. The Blomus ARA Tray or Soap Dish is shallow with a depression creating the dish element. It measures just 3cm in height and has a diameter of 12cm and is constructed from a stainless steel base with the Blomus branding etched into its matte finish. The top of the dish is constructed from high quality white polystone, creating an attractive contrast, simple yet effective and easy to fit into any modern interior. 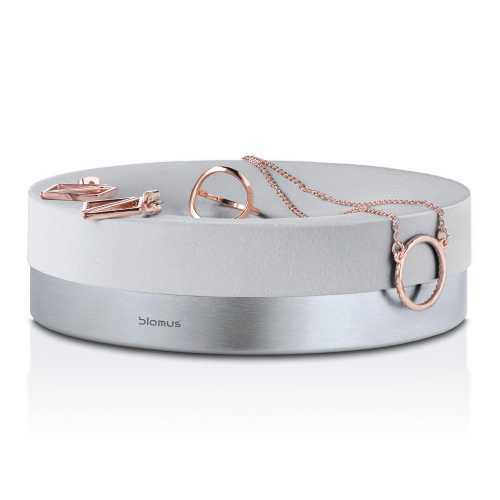 The simplicity of this soap dish allows it to coordinate wonderfully with your chosen bathroom décor and it can be teamed with ease with other accessories, from both the Blomus ARA range and other pieces you may choose.